The BEST In NEW And Certified Pre-Owned Cars ,trucks,vans, And Suv's!!!!!! Great Prices And The BEST Warranties!!! 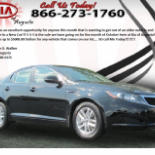 Kia Of Augusta in Augusta is a company that specializes in New & Used Car Dealers. Our records show it was established in Georgia.